"47 Ronin" has received its fair share of press due to its runaway costs and missed released dates. Branded a troubled production, it's with some relief to report that the feature is not a mess, just misguided in a manner familiar to moviegoers who've previously been subjected to the runaway ambition of a first-time director with access to unlimited funds. His name is Carl Rinsch, and while his career will undoubtedly survive "47 Ronin," let's hope the experience assembling a fantasy samurai picture of this magnitude will provide him with much needed focus for any future endeavors. This one simply gets away from him, and while it's handsomely made, the work is stiff, still, and tonally unsteady. In feudal Japan, a kingdom is under siege by the evil Lord Kira (Tadanobu Asano), who, under the care of witch Mizuki (Rinko Kikuchi), is out to claim absolute power, inching control away from the Shogun (Cary-Hiroyuki Tagawa). Robbed of his master due to Mizuki's trickery, samurai Oishi (Hiroyuki Sanada) is left a ronin, banished from his home as Lord Kira prepares to complete his mission by marrying Mika (Ko Shibasaki), the daughter of a slain leader. Gathering what remains of the samurai, Oishi plots his revenge, turning to Kai (Keanu Reeves) for assistance. A "half breed" outcast from a haunted forest, Kai has been targeted for abuse most of his life, yet his debt of gratitude to his adoptive home is too great to dismiss, along with his love for Mika, with their forbidden pairing driving his determination to end Lord Kira's destructive reign and bring honor to the land once again. The story of the Forty-seven Ronin is a tale that's transformed into legend, inspiring works of art and dramatization for centuries in Japan. Rinsch and the screenwriters take this lead of embellishment and turn the saga into a story of demons, witches, and monsters, removing all traces of reality to play up the plot as fodder for blockbuster filmmaking. The true textures of Japanese myth are smoothed down to examples of costuming and set design, with the majority of the tale resembling a Western take on Eastern principles of honor and brotherhood, contorted to meet the needs of a Keanu Reeves starring vehicle. Perhaps it was a bad idea from the get-go, as much of "47 Ronin" plays like a CliffsNotes version of Japanese culture, with struggles of leadership and longing drained of their meaning, handed a melodramatic makeover while CGI creatures jump into the mix, watching Kai handle a runaway dragon-like creature through a nearby forest, or step carefully around Mizuki's many forms. It's a jumble of inspirations and intentions that slips out of Rinsch's control early on, never to be reclaimed until the oddly brave finale that stays true to the Forty-seven Ronin narrative, surprising with a sucker punch of darkness the rest of the feature could've used more of. This being an iTunes digital download, the visual fidelity is excellent, with crystal clear imagery and vibrant colors that are about as close to reference quality as you can possibly get. The costumes, the locations, the sets are all very colorful and vibrant. I watched this on my laptop, so clearly I wasn't getting the fullness from the audio, but regardless of what I was missing, what I was hearing was pretty powerful and packed a nice punch. Ilan Eshkeri's score was also a highlight for me. "47 Ronin" is an expensive picture, and, thankfully, the money is on the screen. Boasting big, layered sets and exceptionally detailed, artful costuming, the movie is something to see. The particulars of this world are tended to with tremendous care, making the film valuable for its sense of exaggeration as colors explode and decorative outfits take center stage, allowing the viewer a chance to absorb something of merit as the storytelling eventually falls into a coma. Although "47 Ronin" is a tale of revenge and otherworldly presence, screen energy is missing, as most scenes fall flat due to uninspired dialogue and sluggish plotting. Unsure if it wants to be a political or heroic, the effort ends up confused, uncertain how serious it should be, especially with Reeves (an earnest actor, but miscast here) in the lead role. There's an oversized samurai enforcer, acts of seppuku, a scene where Mizuki attempts to feed sushi to Mika with her floating hair, a visit to a demon dwelling where the ghouls have four nostrils, and a Dutch fight club where Kai hones his battle skills. This picture should be more fun. Instead, "47 Ronin" is inert, painfully so, aching to come alive as a swirling, slicing samurai epic that deals confidently with displays of renewed nobility and spiritual love. To its credit, the feature never derails, it simply lacks forward momentum. It's a mute-button movie, with passages of gorgeous cinematic craftsmanship. It's too bad the rest of the effort blocks the view. Download 47 Ronin from the iTunes Store in Digial HD. 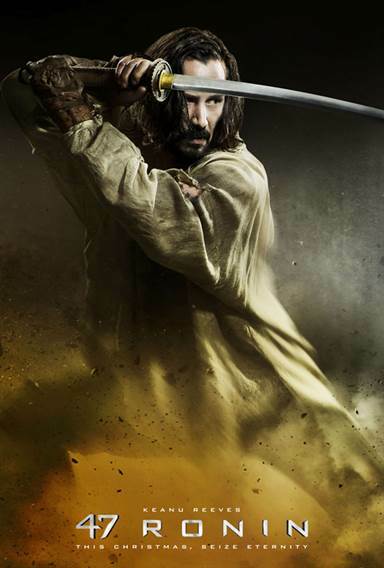 For more information about 47 Ronin visit the FlickDirect Movie Database.